The Armory Blog reports that they have found “the perfect gift for the boozehound and gun enthusiast in your life”. To wit, a 12 Gauge Shotgun Shell Shot Glass set. According to the reviews on Amazon, this product could find an audience using much higher quality materials and a higher price point, but I still love that this exists. 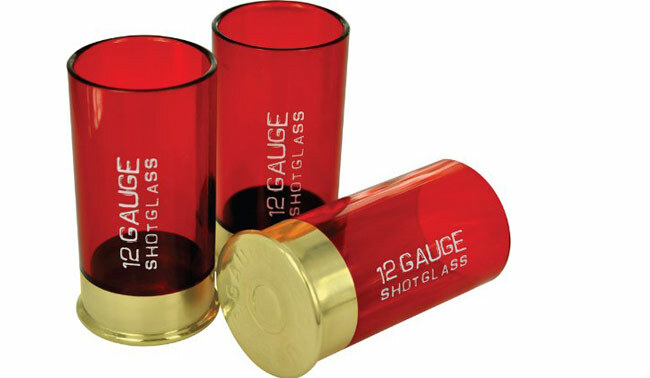 12 Gauge Shot GlassesFire off a few rounds with our set of 12 Gauge Shot Glasses. Load each barrel with your favourite tipple, aim and fire! A great idea for Valentines gifts for him, and the perfect gift to accompany our Shots Gun, this set of 4 Shot Glasses look like empty bullet shells. The perfect accessory to any Wild West, Gangster or James Bond party, these glasses look fantastic and make great novelty gifts.Each glass is made of plastic with a metal base and the classic ’12 GAUGE SHOTGLASS’ stamp on the side. Whether your sin is Tequila Slammers or Vodka, shoot them back in style with these 12 Gauge Shot Glasses! Cause a stir at BBQ’s, our Shot Glasses are certainly a talking point. Twinned with our Bullet Ice Cube Trays you can guarantee a perfectly themed event. Why not treat a friend to a bottle of their favourite liquor and some of our fantastic 12 Gauge Shot Glasses! You’ll have a blast!